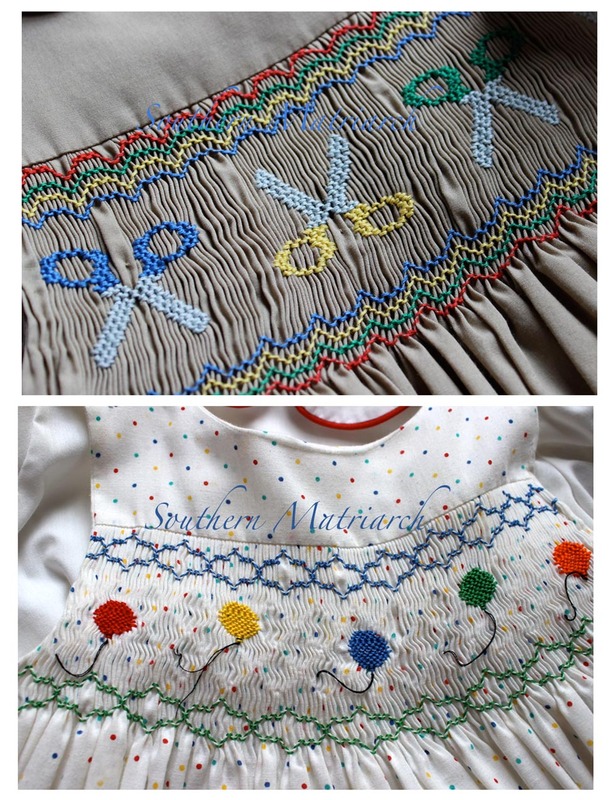 Sarah posted a comment under the previous post asking about picture smocking. I've not yet tried smocking anything other than geometric patterns- how hard is it to catch onto? In answer to your question Sarah, I think it is very easy to catch onto. To be honest, it didn't occur to me when I first tried it that it should be more difficult. Ignorance is bliss. I had smocked one geometric Christmas ornament in a class, my second project was picture smocking. I jumped right in oblivious that it would be any different. 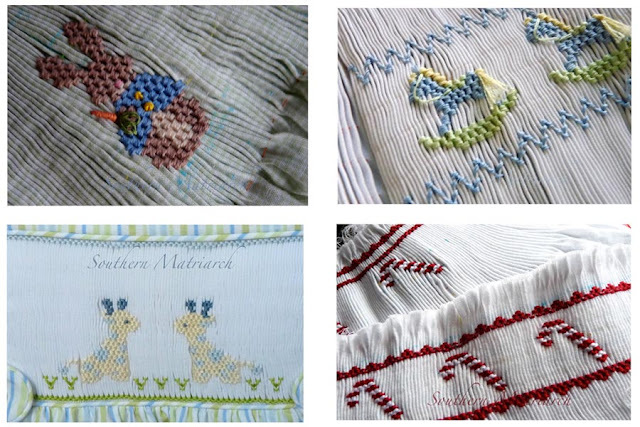 That being said, my first picture smocking attempts were very simple designs. Probably a key to my success. I can't remember which one of these I did first. The scissor dress is shorter, so perhaps it was that one. Plus the backsmocking is much better on the balloons. Both of these jumper/blouse sets are Children's Corner Amy. Little did I know we would have an Amy in the family within two years. There is so much wrong with these yokes. No interfacing in the yoke, I obviously hadn't heard of piping a yoke yet and they could have used to be under-stitched. The facing flops forward on both of them. Hey, you work with what you know and when you know better, you do better. 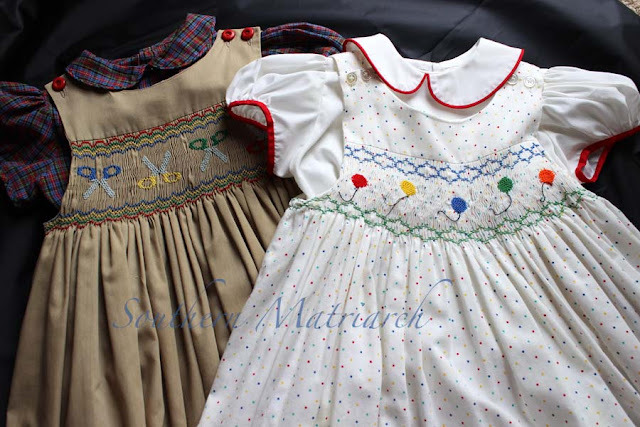 These dresses are both 30 years old and were worn a lot by three little girls. Picture saddle oxfords and black patent leather shoes. Not sure if Princess will be able to wear them. I hope so. As I mentioned, my first attempts were simple shapes with few, if any, color changes. 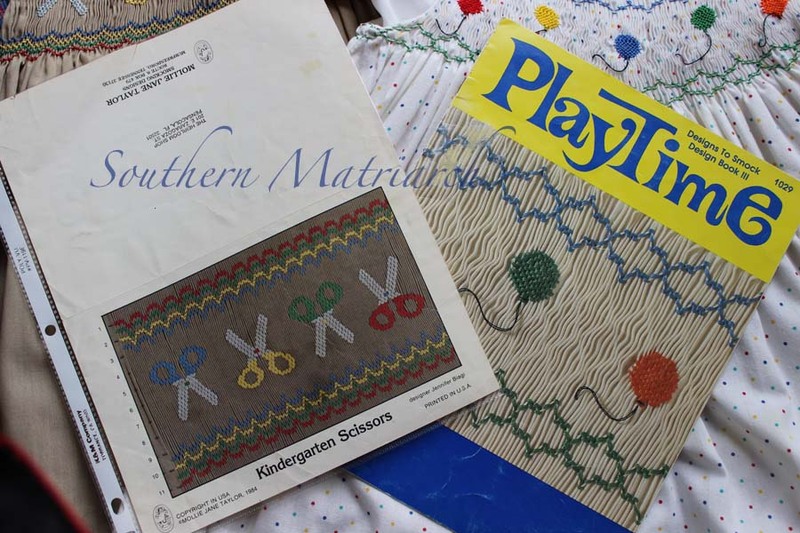 The process of picture smocking is called stacked cables. 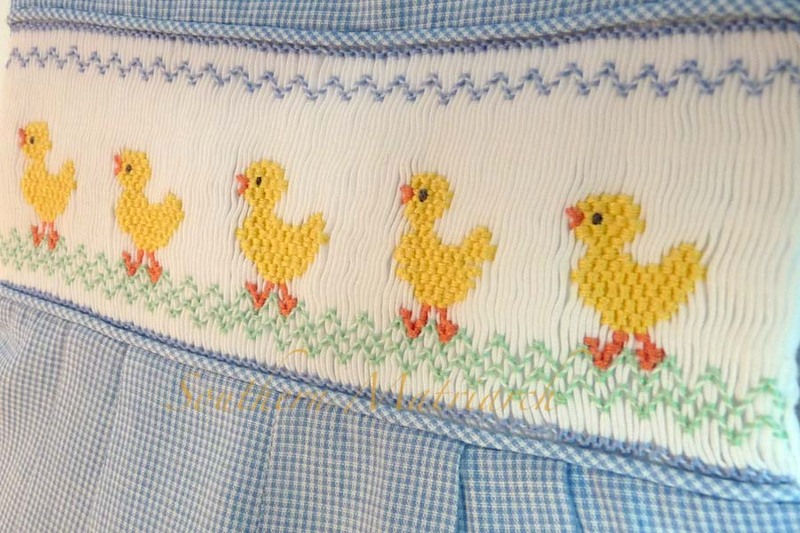 So if you can stitch a cable stitch you can picture smock. Trust me! There are also several books that would help. Michie Mooney has a Beginning Smocking book available at Farmhouse. Ellen McCarn's book is also a wonderful resource. It has some beginning plates included in the book. Also available at Farmhouse. Country Bumpkin has also reprinted their book on smocking. Available at Vaune. Laurie Anderson at Southern Stitches also has video tutorials on Youtube. Here and here and here. So Sarah, give it a go! Picture smocking is fun and very versatile. You can picture smock on bishops also. Parting shot: Amy wearing "Amy". It is obviously her fifth birthday two weeks before she started kindergarten herself. 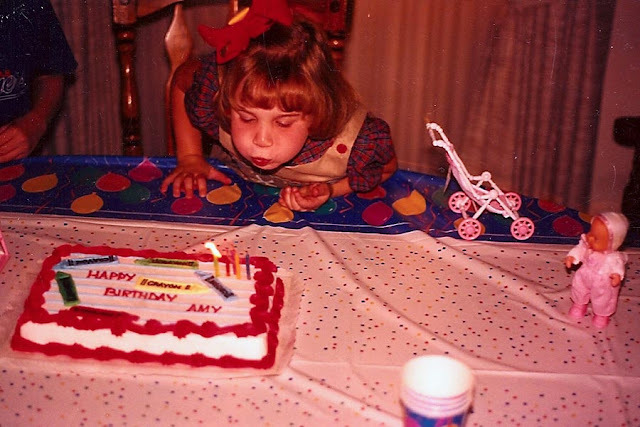 Almost 23 years ago. That is it for today, faithful reader. I hope you have picked up a needle today to take a stitch or two. Hey, Martha!! Wow, thanks for responding to me in such grand fashion :) I think I'll dive into a picture plate for my next project!! Thank you so much for the pep talk and inspiration!! Love the scissors picture you did for your sweet Amy- thanks again, Martha! Wonderful, encouraging post, Martha! I loved seeing your earliest picture smocked dresses. I still consider myself a novice at picture smocking. It takes me such a long time to do and I have only done relatively small figures. I sure hope that Princess will get to wear the "Amy's". I love looking at those early projects. The process to perfecting the art is an interesting tale. Everyone has such a personal story. I love the saying, "As we know better, we sew better." You are a great inspiration.